IBD is a chronic disease that is not infectious in nature. The onset of disease frequently occurs in early life with the peak onset ranged between 20 and 40 years of age. Symptoms of IBD can be broadly divided into intestinal and extra-intestinal manifestations. Intestinal symptoms include per rectal bleeding, mucus in stool, abdominal pain and diarrhoea. Weight loss, fever, anemia, joint pain, inflammation of eye and skin are the extra-intestinal symptoms. CD can affect the entire gastrointestinal tract whereas UC is restricted to colon. Research findings from the Department of Medicine and Therapeutics at The Chinese University of Hong Kong (CUHK) revealed that between 1986 and 2001, the incidence of CD increased 3-fold, reaching 1.0 per 100,000 people in 2001. The incidence of UC increased 6-fold in the past 2 decades. In 2006, the incidence of UC was 2.1 per 100,000 people. The rise in the incidence of IBD might be related to urbanization and the change in diet. Both CD and UC are not medically curable. Medical therapy aims to induce remission of the disease, eliminate disease-related symptoms, and to prevent relapse. Conventional medical therapy includes 5-aminosalicylic acid, corticosteroids, and immunomodulators (azathioprine/mercaptopurine, cyclosporine, methotrexate, etc). CD and UC can result in complications such as fulminant colitis, toxic megacolon, massive intestinal bleeding, bowel perforation, intestinal obstruction and bowel cancer, etc. If complications arise, patients need to undergo surgical operations. In the Prince of Wales Hospital, more than 40% of the CD patients underwent surgery ten years after the diagnosis. Some of them even required two or more surgical operations. For UC, the probability of colectomy in ten years was 7.6% after the diagnosis. In recent decades, the use of biological agents has revolutionized the treatment of IBD. Biologics including infliximab and adalimumab have been shown in clinical trials in the West to be efficacious in inducing and maintaining remission of IBD. Approximately 40% of the CD patients and 35% of the UC patients achieved clinical remission one year after biological therapy. Moreover, there is evidence demonstrating that they are effective in preventing relapses (including relapse after surgery) and in improving quality of life of IBD patients. In the Prince of Wales Hospital, about 20 IBD patients had received biologics in the past 10 years. Among them, over 50% had clinical improvement after the therapy. The side effects of biologics are less compared with immunomodulators. However, not every patient can receive biological agent. In summary, the incidence of IBD continues to rise in Hong Kong. The onset of disease frequently occurs in early life, and it can lead to significant morbidity. 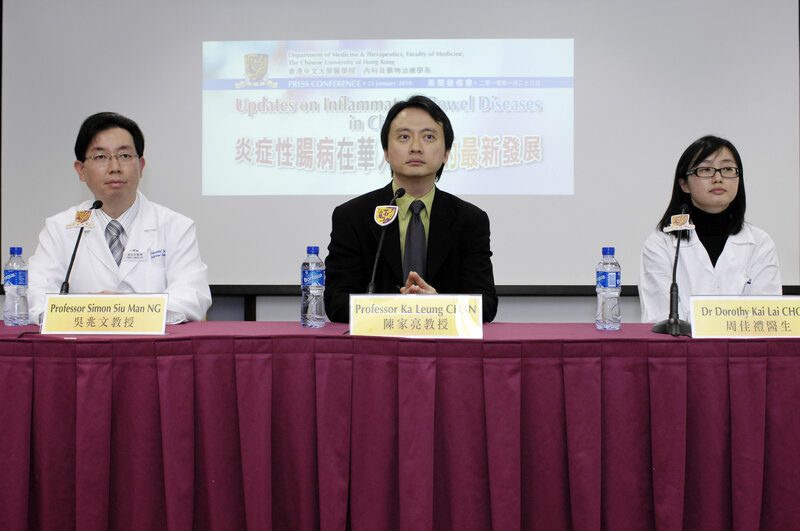 CUHK Faculty of Medicine urges patients who have the above-mentioned intestinal symptoms to seek medical advice promptly.